Makerspaces are popping up all over the country, especially in high school and collegiate settings, and are geared towards an active and collaborative way of thinking and approaching challenges. “We know that in today’s job market there’s increasing need for people with 21st-century skills, especially the ability to innovate, collaborate and respond to change in creative ways,” says Kim. “It’s a higher-order way of thinking that requires practice, not just theory. 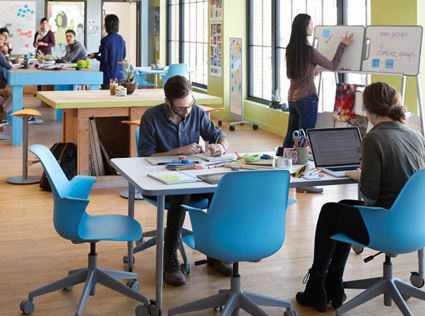 By teaching students to be collaborative and creative, schools are sharing the same goals as employers.” But the reality is, that new types of thinking require new types of education spaces and many are modelling their “Makerspaces” on corporate innovation spaces. 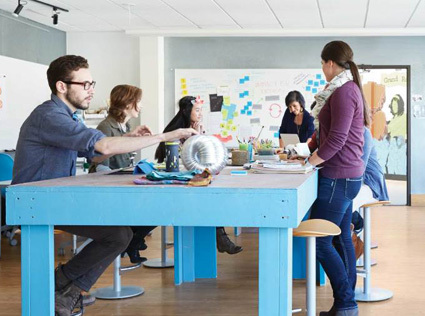 Steelcase, with the launch of it’s Innovation Center, coupled with years of research into creative and active learning spaces can offer some insight into what factors matter when creating a Makerspace. Bright colors, comfortable furnishings, daylight and access to the outdoors stimulate engagement. Ambient stimuli can foster creative thinking. Dull surroundings stimulate boredom. Make it flexible and make-your-own: Allow teachers and learners to configure the space to meet own their needs, recognizing these change from class session to class session and from one phase of the project to another. Mobile furniture is a must for configuring a variety of settings. Making and collaborating tend to be noisy, while contemplation thrives on quiet. Make sure the layout and furnishings are fluid enough to support students who want to work alone between collaboration sessions. Especially if it’s a space that houses machines for making prototypes, separate thinking areas from making areas as much as possible. Arraying materials helps teams “think out loud” about ideas and possibilities. Make sure that work surfaces are large enough for teams to gather around, and include adequate storage for materials and work-in-progress. Working at a desk or table is private to those around it, but mobile and fixed whiteboards let everyone share ideas in the making and exhibit successes. When it comes to whiteboards and markers, there is no such thing as too many. Physical postures and body movement can influence the creative process. In groups, standing can encourage interactions and engagement. For individual work, relaxed postures or walking can promote new ways of thinking. More and more, relevant content exists in digital formats. Choose technologies that allow participants to easily share what’s in their devices as well as what’s in their minds. Want to learn more? Here are a couple of links to articles about Makerspaces! How biophilic design impacts wellbeing at work.